For a prequel that really isn't a prequel, the first season of Krypton is better than I thought it would be, although still a story that seems stretched out for the purposes of being a TV series, when a mini-series or extended movie might have worked better. That said, the Blu-ray release features solid A/V for each episode, along with a few worthwhile bonus materials. Still, it's unlikely even the most die-hard of Superman and DC fans will want to view this content more than once. Rent It. When I first heard about DC’s plans to make a TV series named Krypton, I have to confess I thought it was a pretty bad idea. I’ve been a die-hard Superman fan all my life (he’s by far my favorite superhero), but the Krypton stuff has always been needless backstory for me. It tells us where Superman came from, but who he is always had more to do with Ma and Pa Kent than it did Jor-El and Lara. On top of that, DC was planning to go back even further - giving us a story about Superman’s grandfather, Seg-El (played by Cameron Cuffe). So that character is even further removed from the Last Son of Krypton. When you add to that that the people of Krypton have no superpowers on their home world, things get even more questionable. How do you make a superhero show with no superheroes? Fortunately, the creators of Krypton seem to have asked the above questions during the development of the series as well. And while I’m not sure they came up with the best answer to address them, they’ve at least come up with a “hook” that attaches Superman to this series without (of course) ever having to worry about making the Man of Steel part of the series. The gist of the idea was to make Krypton both a prequel and a present-day story using time travel. 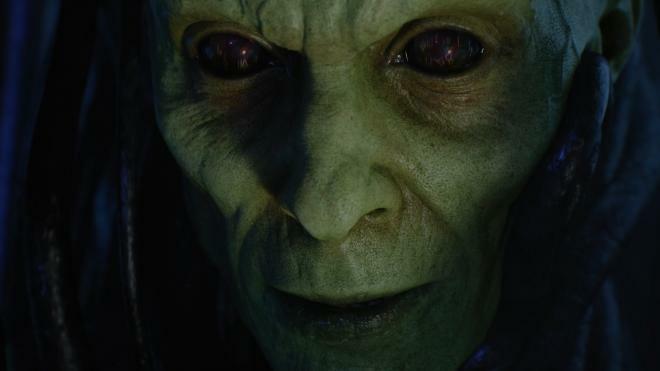 In Terminator-like fashion, the super-villain Brainiac (played via CGI enhancement by Blake Ritson) has decided to go back in time and destroy Krypton earlier than its previous doomsday date, in order to make sure Kal-El is never even born. 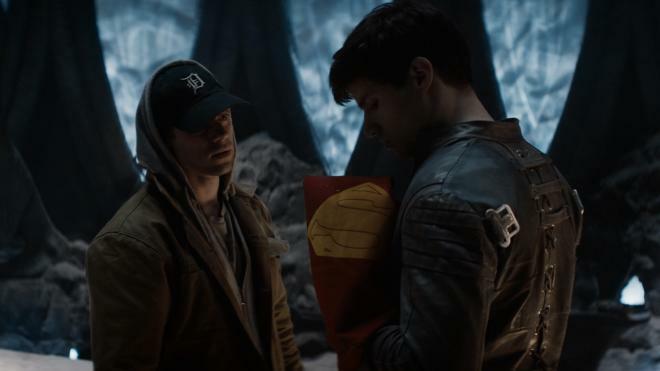 Our present-day Superman (who, once again, we never see) has sent Adam Strange (Shaun Sipos, who reminds one of a young Brad Pitt…at least he did me) back to Krypton to try and stop this from happening. But Strange can’t do it on his own. He needs to recruit Seg-El to, among other reasons, find and unlock the House of El’s Fortress of Solitude, created by his now-deceased grandfather (played by Ian McElhinney, and who was executed for suggesting that Kryptonians were not the only life in the universe) who – like Superman’s own biological father on Earth – now appears to Seg-El via holographic image. While the Brainiac threat and the idea that if Seg-El and Adam don’t succeed, Superman will cease to exist (Strange has brought Superman’s cape with him, which is slowly disintegrating like sands through an hourglass – a visual representation of a “ticking clock”) is the best part of this series, all the other “prequel” material didn’t really work for me. David S. Goyer, who has been hit or miss (many would say more miss than hit, but we’ll leave it at that) when it comes to superhero stories brought over a number of his Kryptonian ideas used in Man of Steel, most notably the fact that Krypton’s population is produced by large computer-run “baby-making” factories, rather than procreation. It’s also a world of pre-arranged marriages – and, of course, both Seg-El and the person he’s in love with, Lyta-Zod (played by Georgina Campbell, and no Superman fans, her House name is not a coincidence) have already been committed to other people. Krypton is certainly designed to appeal to a certain type of fan. If you’re fascinated by medieval-type societies where class status determines one’s lot in life; if you enjoy seeing the lower class rise up and take on the ruling oligarchs; and if you haven’t got your fill of this in a dozen other TV series (Goyer seems to draw inspiration from his own Da Vinci’s Demons, if not other series he’s not been involved with), then Krypton may be for you. For everyone else, Krypton is definitely something you’ll want to rent (or perhaps try and catch an episode or two on TV) before you make a purchasing decision. For me, it feels like something that might have best been served as a mini-series or an extended movie – or possibly even a story arc on one of DC’s already-established superhero series. Season One is only 10 episodes long, and even here it feels as if the showrunners are stretching out their ideas for as long as they can. Krypton is better than I thought it would be, but it’s still one of the “lesser” pieces of TV entertainment brought to us by DC. 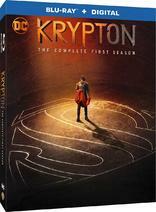 Season One of Krypton arrives on Blu-ray in an eco-Lite Vortex keepcase, which houses two 50GB discs along with a pair of inserts: one containing a code for a digital copy of the season, the other providing a list of contents for each of the two discs, including a one-sentence synopsis for each episode. The keepcase slides inside a cardboard slipcover with matching artwork. There are no front-loaded trailers on either disc, whose main menu features the same still seen on the box cover, with menu selections horizontally across the bottom of the screen. Each episode of Krypton is shot digitally and presented in the 1.78:1 aspect ratio. While I couldn't find out what specific equipment was used to shoot these episodes, they have been provided nice transfers onto Blu-ray, with some noticeable depth and detail and very few problems when it comes to glitches like banding, aliasing, or noise. A lot of the series, by design, takes place in dark or dimly lit soundstages, which serve primarily to mask the fact that Krypton consists of almost entirely indoor locales (it's hard to shoot on location when you're trying to portray an alien world on a somewhat stringent budget). That sometimes hurts the image, as – with most digitally shot material – dark indoor sequences always come out looking a bit flat. But when the scenes move to brighter interiors, once is able to see just how much "pop" this transfer provides. The featured track for each episode is English 5.1 DTS-HD Master Audio, and as TV shows go, each episode of Krypton sounds pretty good. Dialogue is primarily front and center, although the occasional crowd sequence or public announcement will throw some dialogue to one of the rear speakers. While the audio is never quite to the point of full immersion, some moments play very well, particularly fight sequences or sequences involving crowds of people (whether out on the streets of the city or inside the bar that our characters frequent). When events are less active on screen, the surrounds are used primarily to amp up the musical score from composer Pinar Toprak. Overall, everything is clean and crisp, without a hint of muddiness or other problematic glitches. In addition to the lossless English 5.1 track, a German 5.1 Dolby Digital track is also available for each episode. Subtitles are an option in English SDH, French, German SDH, Dutch, Danish, Finnish, Norwegian, and Swedish. 2017 Comic-Con Panel (HD 22:52) – Footage from the 2017 San Diego Comic Con Panel for Krypton, with star Cameron Cuffe and showrunners Damian Kindler and Cameron Welsh. The panel is moderated by DC Comics Chief Creative Officer Geoff Johns. Deleted Scenes (HD 5:37) – The deleted scenes are all lumped together into this short segment, without any notation as to which episode they belong – although viewers of the episodes should be able to make an educated guess. The scenes are unfinished, meaning that green screens can sometimes be seen in the background of shots. Deleted Scenes (HD 2:46) – Another batch of deleted scenes, this group taken from the episodes that appear on Disc 2. Bringing the Home World to Life (HD 17:04) – This behind-the-scenes featurette takes a look at the production and set design. 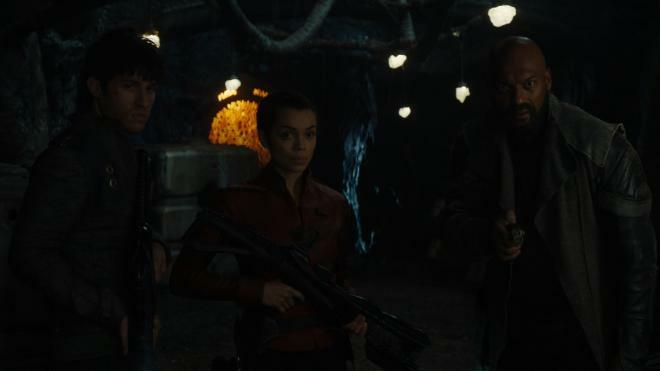 Included here are comments from Executive Producer Cameron Welsh, Executive Producer David S. Goyer, Executive Producer Damian Kindler, Staff Writer Nadria Tucker, Visual Effects Producer Ian Markiewicz, Production Designer Ondrej Nekvasil, Prop Master Ray Perry, Prop Master Paul Stewart, and star Cameron Cuffe. A Lost Kingdom: Life on Krypton (HD 22:38) – In this featurette, members of the cast and crew talk about the world of Krypton and how the series allowed the creators to explore areas of Superman's homeworld not covered before. Included here are comments from Executive Producer Cameron Welsh, Executive Producer David S. Goyer, Staff Writer Nadria Tucker, and star Cameron Cuffe. Gag Reel (HD 3:22) – A brief, but fun, look at some of the bloopers and flubbed lines that took place during the shooting of Season One. I'm not sure a series based on the backstory of Krypton was the best of ideas, but the showrunners at least have come up with a premise interesting enough to make it worth a look. The problem, however, is I don't think their idea warrants a complete series around it or if those involved will be able to keep an audience long term. 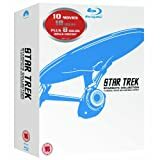 As far as the Blu-ray presentation of this first season, everything has been nicely put together, with solid video and audio and an average amount of bonus materials for a TV series release. But because the story being told is average at best, this release falls firmly into the Rent It realm.